In close cooperation with our customers, we offer all services for conception, development and design handover to production, turnkey or on site. And we are certified according to ISO 13485:2016. We work in close cooperation with authorities and customers to achieve maximum benefit. Software systems for medical devices and life sciences applications - that's what we do every day! Do you know our Lab OS®? Lab OS offers the solution for your sample management, safe, developed according to ISO 13485 and compliant with all necessary international regulations! Do you develop software and want to participate in exciting developments in a small team? Then send us your unsolicited application! Contact us for a non-binding preliminary discussion! Our goal: Your satisfaction with our software solutions through a high utility value, maximum usability and quality. We have been working with many of our customers for many years. They appreciate the trustworthy cooperation with us when it comes to reliable, on-schedule and quality-assured support work. Together with you, we design the solution for your app, desktop solution, web or Cloaud application, from the simple single application to complex systems. Our developers implement system concepts, from turn-key projects or OEM developments to join-your-team. Many variations of cooperation are possible. Over many years of project experience in the field of medicine and LifeSciences products, we have acquired a wealth of experience and established effective processes. Small teams offer high productivity and flexibility because the communication channels are short, responsibilities clear and the exchange of experience effective. As a customer, you know exactly who you are talking to! soventec has many years of experience in the conception and development of complex systems. We know the pitfalls in development and project management, which cannot occur according to definition, but occur nevertheless. We have managed many of our own or external projects, have been part of project teams and can think our way into the human factor in the project and deal with this factor in an appreciative way. Since 2010 we are certified according to ISO 13485. You can rely on development and documentation quality and integrate us into the process as a reliable supplier for medical device development. This software solution, implemented in the environment of ISO 13485 and ISO 62304, monitors and documents the temperature of cryogenic containers for the storage of biological samples at cryogenic temperatures. In the innovation cluster INTAKT soventec develops mobile applications to configure and operate a system of novel active implants. Let us create Value together! Use our experience and competence for your development projects! Any more questions? Definitely. Contact us and let us set sail together! Here you will find news and worth reading about soventec and our field of activity. 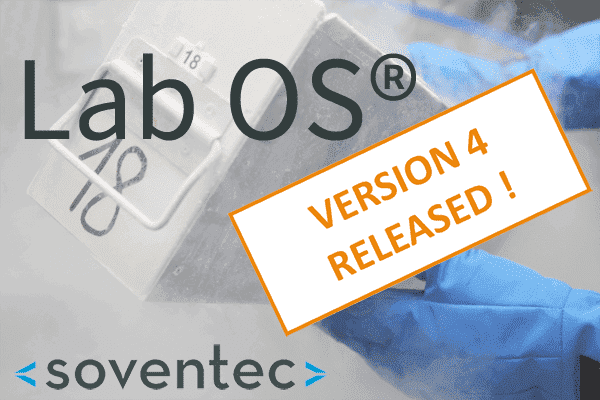 Lab OS released in version 4! soventec becomes "Preferred Supplier" of the US-American pharmaceutical company Bristol-Myers Squibb (http://www.bms.com).